Nice day... odd weather. I got to the 'big kite' field at about 8:30 AM. A very soft wind was coming out of the west, straight onshore; Long Beach usually gets a north or northwest wind (right down the beach). Several of the big kites were already up, so I launched Big Boy with his 75' tail and a new spinsock on the line. For me it was a special flight, because I was finally flying on the 'big kite' field at a major kite festival. The days theme was "Paint Me Patriotic," so there were many red, white and blue kites in the air. Today they held the 10th annual Foster Grandparent Fun Fly. A 'foster grandparent' is paired with one or more temporary 'grandchildren' who earn a new kite by learning how to properly fly it. 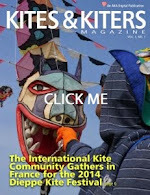 The Washington Kitefliers Association (WKA) gives away over 100 handmade kites each year at WSIKF. One of the really fun events is the bol races. Kids in age groups race across the sand with a bol behind them. Mike got some great shots of the races. Some of the dual-line competitions were held today as well as flying demonstrations by both dual-line & quad-line fliers. Here's a short video of stacks of Revolution quad-line kites being flown by some of the very best fliers in the country. At the end of the day many of us went to a WKA lasagna fundraiser dinner. There were over 100 donations of merchandise for the brown bag raffle. I bought $10 worth of tickets and won a cody kite worth over $60. Now I have a cody in my collection, so I can participate in the cody-fly on Saturday. All in all, it was a good day at the festival.